In a futuristic world where plastic surgery has become fashionable, a giant corporation responsible for the financing of organs, and their recovery in case of non-payment, is the scene to the greatest scandal. 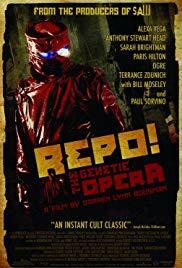 Repo, the Genetic Opera, is one of the very first example of combining musical and horror genre. This movie, directed by Darren Lynn Bousman (Saw II, III and IV as well as the great Mother’s Day remake) is a very good surprise. 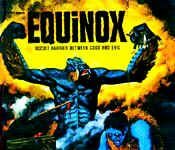 Better be warned, this is a full-scale musical and there barely is any normal talking, everything is sung. It is then up to everyone’s personal taste, I personally hate musical and this aspect of the film truly ruined my experience, but those who enjoyed macabre musical such as The Rocky Horror Picture Show or Sweeney Todd should have a wonderful experience out of this film. The musical aspect put aside, I must confess that the movie is brilliant. The concept of the Repo Man, and the futuristic world created around it, is worthy of the best science-fiction scenario. Visually, The Genetic Opera is impressive and shot in a very stylish way that reminds of movies such as Sin City or Sucker Punch. The story is filled with colorful characters for which each side-story is explained in a cartoon-like fashion as you progress through the film. This brings an extra dimension to the movie, allowing it to go deeper into the plot without losing ages introducing the various protagonists.